Lady Ginny Williams. © Sutton Motorsport Images. 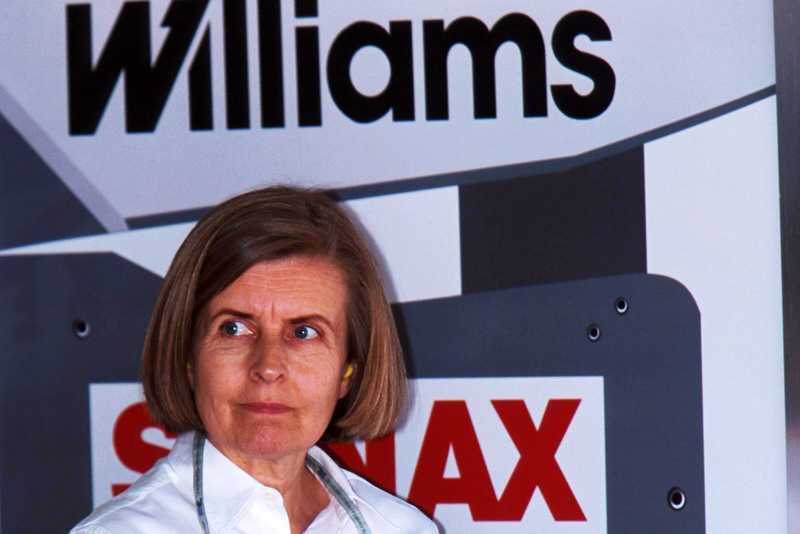 It is with enormous sadness that I must report the death of Lady Virginia Williams, the wife of Sir Frank Williams. She was 66. Ginny had been suffering from cancer for some time and knew from an early stage that the disease was incurable. It was simply a matter of time. Characteristically, she looked at the situation in a positive way and set about enjoying whatever life she had left with courage and humour. She lived every day to the full and did things that she had always wanted to do, including getting Frank to buy her a house close to the sea, as she had always wanted to live in such a place. One of the best days was in Barcelona last year, when the Williams team finally won a race again, after years without success. Ginny was there to celebrate Frank’s 70th birthday, but was delighted to be able to enjoy Pastor Maldonado’s amazing victory as well. Born soon after the war, Virginia Berry led a very conventional and comfortable life, marrying at 21. Her husband was a racing driver and as a result she soon met the ambitious young Frank Williams. After that her life changed completely. There was a divorce and she soon sold her maisonette in Knightsbridge in order to help fund Frank’s racing adventures and joined him in the struggle to be the best of the best. It was not easy. When they married in 1974 Williams was still the joke of the F1 paddock and there was never any money. The role that Ginny played in the Williams F1 story cannot be overlooked. She hid the bills so that Frank would not have to worry about them and juggled what little they had to make ends meet. She gave him strength. She was even responsible for finding the carpet warehouse in Station Road, Didcot, into which the team moved in 1977, beginning the team’s history in the Didcot area, where today the team employs more than 500 people. Ginny was always Frank’s biggest supporter and his closest advisor. He listened to her opinion on all things, whether it was a question of who to hire or what alliance to make. The expression “behind every great man, there is a great woman” was never more true than with the Williamses. In addition to bringing up the family – Jonathan, Claire and Jaime – and running the large estates on which they eventually ended up lived, Ginny also proved herself to be an accomplished writer, with her book “A Different Kind if Life” detailing the struggles that they went through to make Williams F1 a success and then the experience of having to cope with her husband being paralysed. Her feisty nature and strength of character helped Frank through the ups and downs of life, with great courage and much humour. She grew to hate the book, saying it was too honest and too painful, but it stands today as one of the greatest and most spellbinding books you will read about the sport – if you can find a copy. Same here, just bought a copy for a pound. Thanks for the recommendation Joe, condolences to the Williams family and the team, an inspirational group of people for sure. They went quickly, cheapest is now £26.24! Too much for me. I see a copy in the States for under 5 bucks. Check Abe Books. Only one going . . Such a loss. She sounds like an extraordinary woman. My thoughts are with the family. This is so terribly sad for the Williams family. I read her book when it was first published and realised then what a great and resilient woman she was. “behind every great man, there is a great woman” – absolutely 100% true in this case. Those of us males fortunate enough to have a good woman sharing our lives with us should appreciate them much more than perhaps we realise. How very sad, my condolences to the family and friends. My sincerest condolences to the family. What an adventure they both had together. Condolences to Sir Frank & the Williams family. A remarkable Lady. What an amazing woman. No doubt she will be missed. My condolences to entire Williams family. This is a sad day for the williams family, they have my very deepest sympathy. I read this book called ” a different kind of life” very true, a very raw experience to read. A fantastic woman whom many a men wished they had, talented writer, williams excecutive and a mum to her three children and will be sorley missed. A dark cloud looms today but a ray of light tomorrow. R.I.P. Condolences to the family and the team. A big blow on the eve of the season. Lovely lady, Frank must be very upset at her passing. You don’t find many like her in the F1 scene now. Condolences to Frank and the family. My thoughts go to Mr. Williams and his family. Must be a very tough time, and I hope he can stay strong. I can only imagine losing your love so early, but it sounds as though he likely has many great memories that should bring a smile when he’s down. Condolences to Sir Frank & his family and the whole team. Joe: I must say, this is the most sensitive, comprehensive and positive tribute to Lady Ginny that I have so far read. Joe, thanks for writing such a lovely and sincere eulogy. My deepest sympathies to the entire Williams family. A very nice tribute there Joe. I shall of course have to get the book now, then perhaps I will appreciate the great loss in an appropriate manner. I still find it hard to imagine how much amazing racing enjoyment I was able to see, because of this fantastic lady, who had unerring belief in FW’s dreams. There are clichés about a good woman behind every successful man, but I have always thought that there is a successful woman behind every lucky man. That most humble of successes, of loving and supporting someone, and building a life (whether you are man or woman) is the greatest of achievements. I hope that amongst so many remembrances that will flow, for her dedication without self sacrifice, she may be remembered as a example far beyond racing circles. Very truly sorry to hear the news. It was difficult to understand her influence until I read Adam Parr’s recent book The Art of War. RIP Ginny; I echo all the words and sympathies in this thread. Nicely written tribute Joe, never met the lady but your eloquence makes me wish I had. Here’s hoping Sir Frank can carry on in his darkest hour. Great women , I work in the health field and see many partners dump there loved ones after such accidents. Hope the car has a nice tribute on it this weekend. Very sad news and deepest sympathies to the family. As someone who lives just a mile from the Williams factory in Grove, I know what an impact the team has had on the local area as well as the whole of motorsport. Clearly, Ginny played a large part in this success. A reminder to us all that success is almost alway the result of the people in the background. I missed her book when 1st published but I have now added it to my collection even at the inflated prices her passing has triggered. Joe, very sad news indeed but thanks for posting. Condolences to all her family and the wider ‘Williams GP family’. I only wish I could have read the book and feel like I’ve missed out. I’ll have to trawl the second hand bookshops I guess. Love Ron’s reference to Kipling’s ‘If’; classic stuff. RIP Lady Ginny – such an inspiration to so many who knew you. Your courage tenacity and your uncomplaining manner of dealing with your illness put life’s trivialities into perspective. Condolences to Sir Frank and your children and family. Such sad news. A lovely tribute, Joe. a fine tribute Joe. what an amazing Lady. Behind every great man ..
God bless and rest in peace. There are so many heartfelt memories from so many people that shows the love and affection for this lady. To me Ginny & Frank represent a special period in life following a team with a heart of a lion but with fantastic sporting values and this lady was pivotal to that. I met Frank at Didcot one month before that tragic accident in the south of France. I was 17 at the time and mad about F1. To this day the values they represent in F1 are precious and invaluable. I salute the courage, spirit, passion and loyalty of a lady that the world is poorer for her passing. Rest in peace and sincere condolences to Sir Frank all her family and friends. It made me profoundly sad when I read the news yesterday even though, to that point, I was unaware of her contribution to the sport or her battle with cancer. Any wife who sticks with a team owner for so long, so many ups and downs, so many nights alone while her husband is away at races, test, sponsor meetings, etc. is special but any that not only stays through the extreme lows that Williams GP has had but also helped build it up and grow to become one of the more financially sound teams on the grid is an extraordinary person. The world needs more like her. Such sad news and a lovely tribute. I was actually in the middle of her book when I learned of her passing. An amazing human being she truly was. The book is a “must read” even for those not interested in motor sport. Thank you Joe for a beautifully crafted tribute to my sister Ginny. You have summed up her beauty, courage and contribution. She was loved by everyone who knew her. My condolences to the Williams family and all those who knew her. A great and touching article, it even made me cry a little, about a real LADY. My deepest feelings to the Williams family! Very sad, a great Lady and a great character, will be hugely missed. Thank you for this article Joe.